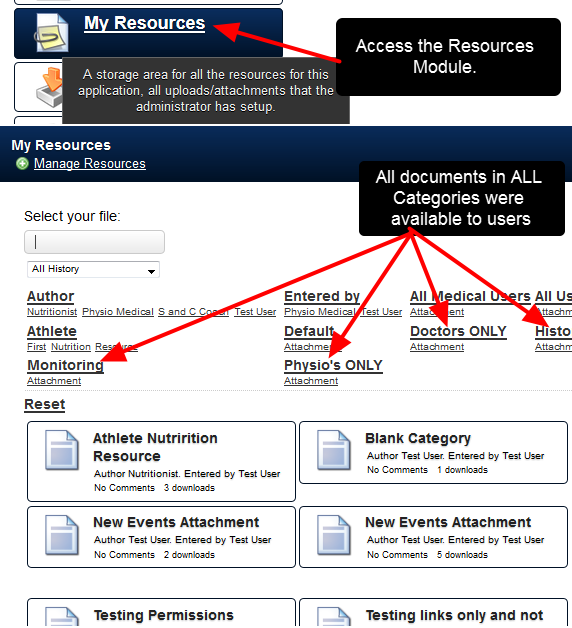 Administration Site Help Documentation The Categories Module enables access to Resources and Resource-AttachmentsWhy do we need Categories (Folders) to be set up on the Administration Site? Restricting access to documents is now possible because each user has to be assigned access to each Category (Documents / Attachment Resource Folder) by an Administrator through the Administration site. There was no way to limit what each user accessed in this Module. Anyone with access was able to access and read any of the documents stored here. This often meant athletes were not given access to this Module, just because coach or doctor only information would be stored here. Now, using the Categories to limit access, athletes can be given access to an "Athlete" Category that all of their documents are stored in. 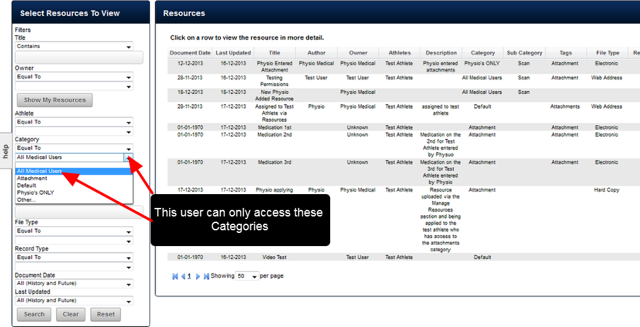 Coaches or Doctors can be given access to categories with their data in them. As long as ONLY the correct users have access to these Categories, the documents within each Category are secure and kept hidden from other users. The Main Categories were used to group the data (e.g. Monitoring, Physio, S and C etc. as shown in the image in the first step). Categories were set up, but they did not restrict access; they acted as a storage point for similar files. 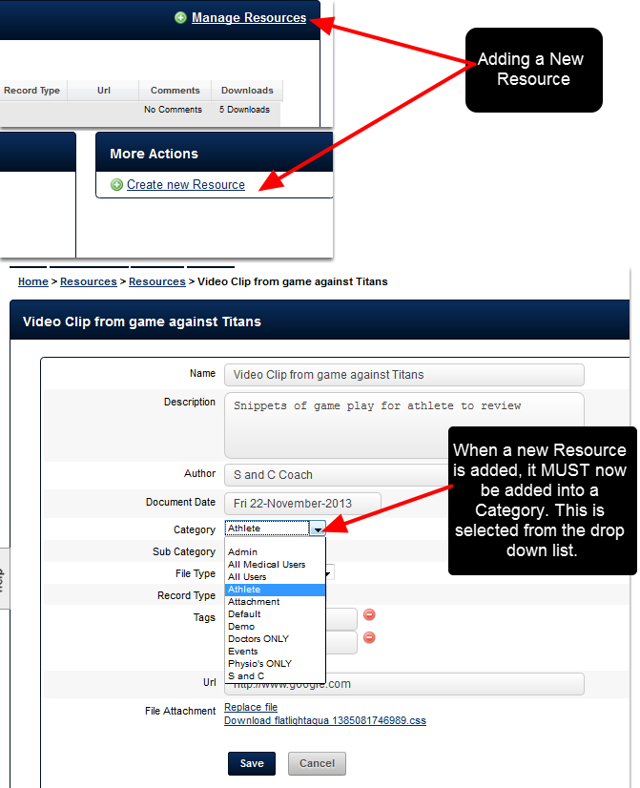 The example here shows a new Resource being added into the My Resources Module. When it is added the user now selects where the Resource will be stored (e.g. in what Category). Each Category appears as a drop down to choose from. These are the categories that were set up Categories Module in the Administration site. -Regardless of which Categories are assigned to a Site Administrator, when a Site Administrator uploads a Resource, or accesses the My Resources Module they will have access to ALL Categories when they login on the main site. This ensures that can manage and maintain all resources correctly. -A Coach Administrator will NOT have access to all Categories in the main site, and they will not be able to view this Module when they login to the Administration Site. Attachments Resources are files that are uploaded to an Event Form. 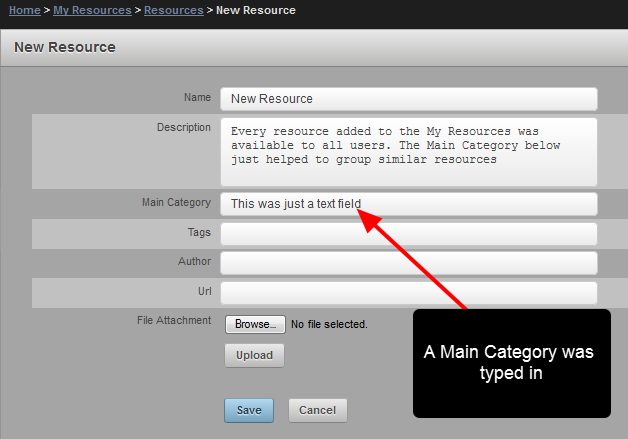 If the form is set up so that the Attachments uploaded to it are Attachment-Resources, access to these is ALSO set based on the Categories assigned to each user.